(Nanowerk News) A new analysis suggests that large-scale wave energy systems developed in the Pacific Northwest should be comparatively steady, dependable and able to be integrated into the overall energy grid at lower costs than some other forms of alternative energy, including wind power. The findings, published in the journal Renewable Energy ("Integrating ocean wave energy at large-scales: A study of the US Pacific Northwest"), confirm what scientists have expected - that wave energy will have fewer problems with variability than some energy sources and that by balancing wave energy production over a larger geographic area, the variability can be even further reduced. The variability of alternative energy sources is one factor that holds back their wider use - if wind or solar energy decreases and varies widely, then some other energy production has to back it up, and that adds to the overall cost of energy supply. "Whenever any new form of energy is added, a challenge is to integrate it into the system along with the other sources," said Ted Brekken, an associate professor and renewable energy expert in the College of Engineering at Oregon State University. "By producing wave energy from a range of different sites, possibly with different types of technology, and taking advantage of the comparative consistency of the wave resource itself, it appears that wave energy integration should be easier than that of wind energy," he said. "The reserve, or backup generation, necessary for wave energy integration should be minimal." This estimate of the cost of integrating wind energy indicated that it would be 10 percent or less than the actual charges being made for the integration of wind energy. Energy integration, however, is just one component of the overall cost of the power generated. Wave energy, still in the infancy of its development, is not yet cost competitive on an overall basis. Wave energy is not now being commercially produced in the Pacific Northwest, but experts say its future potential is significant, and costs should come down as technologies improve and more systems are developed. This study examined the hypothetical addition of 500 megawatts of generating capacity in this region by 2025, which would be comparable to approximately five large wind farms. Another strength of wave energy, the study suggested, is that its short-term generation capacity can be predicted with a high degree of accuracy over a time scale ranging from minutes to hours, and with some accuracy even seasonally or annually. The Pacific Northwest has some of the nation's best wave energy resources, and as a result is home to the Northwest National Marine Renewable Energy Center, supported by the U.S. Department of Energy. 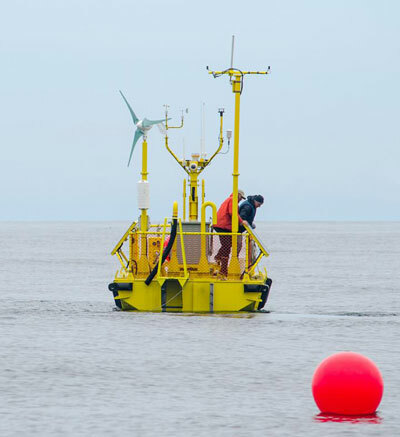 Wave energy in the region is expected to spur economic growth, help diversify the energy portfolio, reduce greenhouse gas emissions and reduce transmission losses, the study noted.